The performance of high-speed semiconductor devices—the genius driving digital computers, advanced electronic systems for digital signal processing, telecommunication systems, and optoelectronics—is inextricably linked to the unique physical and electrical properties of gallium arsenide. Once viewed as a novel alternative to silicon, gallium arsenide has swiftly moved into the forefront of the leading high-tech industries as an irreplaceable material in component fabrication. GaAs High-Speed Devices provides a comprehensive, state-of-the-science look at the phenomenally expansive range of engineering devices gallium arsenide has made possible—as well as the fabrication methods, operating principles, device models, novel device designs, and the material properties and physics of GaAs that are so keenly integral to their success. In a clear five-part format, the book systematically examines each of these aspects of GaAs device technology, forming the first authoritative study to consider so many important aspects at once and in such detail. Beginning with chapter 2 of part one, the book discusses such basic subjects as gallium arsenide materials and crystal properties, electron energy band structures, hole and electron transport, crystal growth of GaAs from the melt and defect density analysis. Part two describes the fabrication process of gallium arsenide devices and integrated circuits, shedding light, in chapter 3, on epitaxial growth processes, molecular beam epitaxy, and metal organic chemical vapor deposition techniques. Chapter 4 provides an introduction to wafer cleaning techniques and environment control, wet etching methods and chemicals, and dry etching systems, including reactive ion etching, focused ion beam, and laser assisted methods. Chapter 5 provides a clear overview of photolithography and nonoptical lithography techniques that include electron beam, x-ray, and ion beam lithography systems. The advances in fabrication techniques described in previous chapters necessitate an examination of low-dimension device physics, which is carried on in detail in chapter 6 of part three. Part four includes a discussion of innovative device design and operating principles which deepens and elaborates the ideas introduced in chapter 1. Key areas such as metal-semiconductor contact systems, Schottky Barrier and ohmic contact formation and reliability studies are examined in chapter 7. A detailed discussion of metal semiconductor field-effect transistors, the fabrication technology, and models and parameter extraction for device analyses occurs in chapter 8. The fifth part of the book progresses to an up-to-date discussion of heterostructure field-effect (HEMT in chapter 9), potential-effect (HBT in chapter 10), and quantum-effect devices (chapters 11 and 12), all of which are certain to have a major impact on high-speed integrated circuits and optoelectronic integrated circuit (OEIC) applications. Every facet of GaAs device technology is placed firmly in a historical context, allowing readers to see instantly the significant developmental changes that have shaped it. Featuring a look at devices still under development and device structures not yet found in the literature, GaAs High-Speed Devices also provides a valuable glimpse into the newest innovations at the center of the latest GaAs technology. 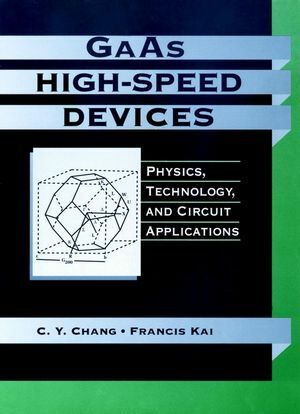 An essential text for electrical engineers, materials scientists, physicists, and students, GaAs High-Speed Devices offers the first comprehensive and up-to-date look at these formidable 21st century tools. In addition, this comprehensive volume places every facet of the technology in an historical context and gives readers an unusual glimpse at devices still under development and device structures not yet found in the literature. C. Y. CHANG is Professor and Dean of the College of Engineering atNational Chiao Tung University, Taiwan. He is also the Director ofthe National Nano Device Laboratory. Dr. Chang was elected a fellowof the IEEE in 1988 for his "contributions to semiconductor devicedevelopment and to education." FRANCIS KAI is an Analytical Tools Engineer at Dell ComputerCorporation. He formerly served as a Senior Systems Engineer atCreative Applications, Inc., Senior Engineer at Compaq ComputerCorporation, and Assistant Professor at Northeastern University.Dr. Kai earned his PhD in solid state electronics from the StateUniversity of New York at Buffalo. He has varied experience insemiconductor processing, high-speed device design, devicemodeling, VLSI circuit design, signal integrity and electromagneticcompatibility, software development, and medical imaging. The Development of Gallium Arsenide Devices and IntegratedCircuits. Gallium Arsenide Crystal Structure and Growth. Hot-Electron Transistors and Novel Devices. GaAs FET Amplifiers and Monolithic Microwave IntegratedCircuits.